Bengal pace spearheads Ashok Dinda An official of the Bengal Cricket Association said that as a precaution, Ashok Dinda has been scanned. They have been advised to relax. Bengal pacer Ashok Dinda was hit on the fore in an Eden Gardens effort to catch his own ball during a T20 practice match on Monday. Dinda team was practicing with the Bengal team under the guidance of consultant VVS Laxman. This incident took place when the batsman Virendra Vivek Singh hit a straight drive and Dinda tried to catch a catch. The ball got out of their hands and got on the forehead. After the injury, he fell down on his crease and fell down. The teammates ran to help him. Later the medical team also reached the ground. 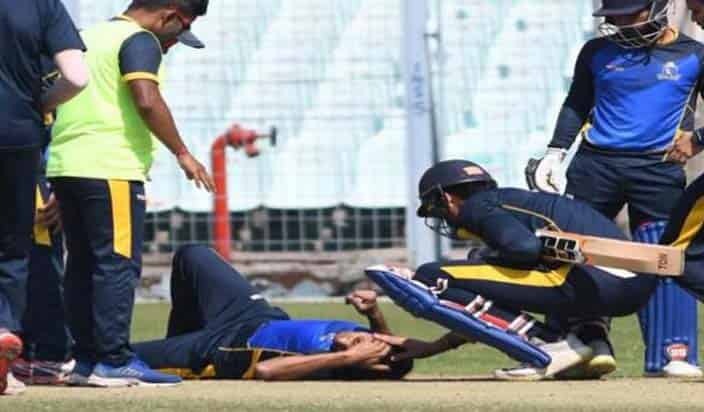 The Cricket Association said, “There is nothing to worry about, but they have been advised to rest for two days.” Bengal team Mushtaq Ali will play the first match against Mizoram in Cuttack on February 21 in the T20 tournament. The 34-year-old Dinda has taken 20 wickets in the last five first-class cricket matches played by Bengal. Till date 115 played a first-class cricket match, Dinda has taken 417 wickets at an average of 28.35.